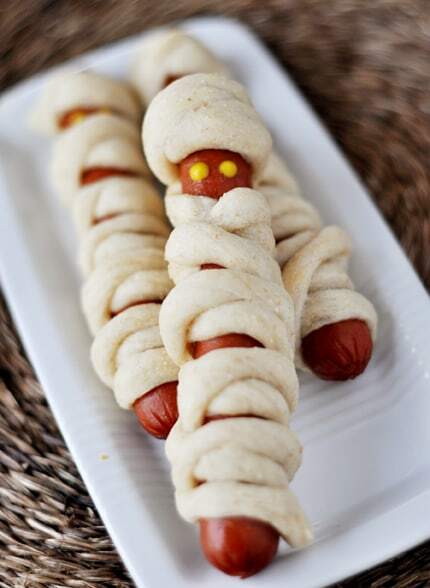 Chances are, if you’ve perused any kind of Halloween cuisine on the internet, these mummy-dogs look very familiar. They are all over the place! So I decided it was about time we devoured some mummy-dogs in our house. I’m thinking it must be a rite of passage somewhere that one must make and eat one or more mummy-dogs in their lifetime. Check that off my list. Phew! The premise is simple – a hot dog, wrapped with breadstick dough, and baked. Then dotted with eyes, dipped in more ketchup and/or mustard and devoured. I used half a batch of homemade breadsticks and our preference on hot dogs is Hebrew National, but use what you like. And so what if my mummy-dogs slightly resemble mummies wearing turbans? My kids didn’t know the difference (thankfully). Looks like I need to work on my food art a bit. And just for the record, my husband is doing a repetition of fist-pumps right now because he always swore he’d do 100 fist-pumps in a row the day I posted a recipe with a hot dog in it. The man loves hot dogs. What can I say. The mummy cookies? Well, they are more of a basic idea than anything. Circle sugar cookies, piped with the flat side of a basket weave tip and punctured with mini M&M’s for the eyes. Did I just say puncture? Sorry, that was a little gory. But this is Spooky Eats week, after all. Seriously easy and some of my favorite decorated sugar cookies I have to say. 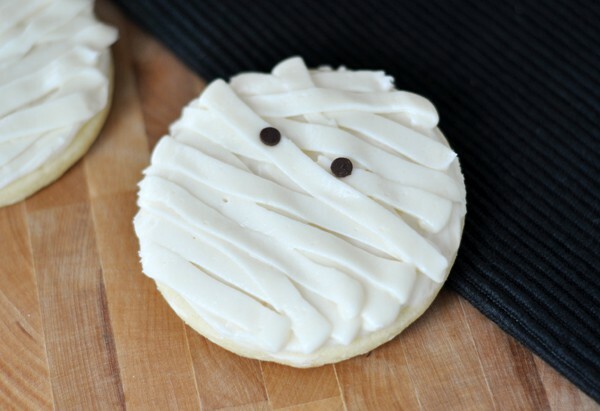 I don’t know what it is about a mummy sugar cookie, but they are stinking cute. So if you are looking for a mummy-inspired menu theme – add these two creations to your list! The kids (er, and the adults) will be sure to be pleased and if we are speaking from the experience in our house, there was nary a mummy leftover, sweet or savory, to fight over. P.S. 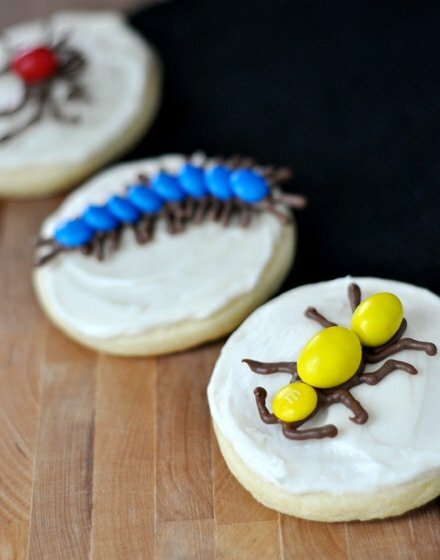 As a little bonus, the bug cookies, below, make an excellent addition to Halloween-inspired cookies. I’ve used these bug designs (on cupcakes and cookies) no less than 10 times after spying them in Hello, Cupcake years ago. Because the designs are copyrighted in the book, I can’t share the specific templates with you but the premise is simple – using melted candy discs to pipe an outline of a bug on wax paper and top with a design in large and small M&M’s. Let them dry and harden, then peel them off the wax paper and place them on the cookie. I don’t know if it is because I happen to have four little bug-loving boys, but these bugs are always the hit of the century. Make the breadstick dough according to the recipe (letting it rest or rise as needed before shaping into breadsticks). Divide dough in half. Freeze half or make it into regular breadsticks. Press the other half of the dough into a thin rectangle, probably about 6 by 9-inches or something like that. It doesn't have to be precise. Cut thin strips of dough, about 1/8- to 1/4-inch wide. Starting at the top of the hot dog, wrap one strip of dough around the hot dog all the way to the bottom. Place on a lightly greased baking sheet (or a baking sheet lined with parchment paper or a silpat liner). Place each mummy-dog about an inch apart. Once all the hot dogs have been covered with breadstick dough, bake them for 10-12 minutes until the dough is slightly puffed and cooked through. 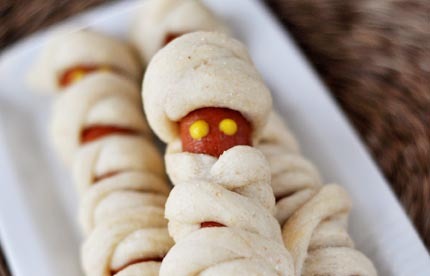 Dot eyes on the mummy-dogs with mustard or ketchup and serve with additional mustard and ketchup, if desired. I prefer Hebrew National hot dogs. They come seven to a pack and I usually use two packages and a batch of breadstick dough (although I only use half the breadstick dough in this application and freeze the other half or make regular breadsticks). Make sugar cookies according to the recipe. Roll out and cut into thick circles, about 2- to 3-inches in diameter. Bake and cool. When cooled, fit a piping bag with the basket weave tip (or another similar tip with a flat side), and fill the bag with frosting. Turn the tip flat side up and pipe strips across the cookie in varying directions, until the cookie is covered with mummy stripes. Place two mini M&M’s for eyes. I made the mummy dogs last night for Halloween dinner and they were a huge hit! Although my dough puffed up a bit more than yours seemed to. Anyway, I’m going to try the bread sticks just as bread sticks! Thanks! Just started reading your blog a few months ago and I love it! I have made these with the store bought dough but I tried these last night with your breadstick dough..holy moley! I will never buy store bought again! Thanks for the awesome breadstick recipe, I am sure it will visit our house often! I made your delicious cookies/frosting yesterday. Everyone loved them. Unfortunately mine didn’t look at great as yours, but they were definitely edible! We had the mummy dogs for lunch today and they turned out super cute and tasted great! I have a question – I froze the rest of the breadstick dough (in cling wrap, then ziploc freezer bag) and would you please tell me the procedure for thawing and baking? Just not sure how long to thaw and where (fridge? counter?) and how long to let rise. Thanks so much! Hi Sarah – when I freeze dough like this, I put it in the fridge the night before I want to use it so it can defrost. Then, about 1-2 hours before I want to shape it (into rolls or breadsticks), I take it out of the fridge and let it sit on the counter. If the dough is expanding too much for the plastic wrap or bag, just place it in a lightly greased bowl and cover. It should come to room temperature and puff up slightly, if not doubled, before using it again in breadsticks. Hope that helps! Super cute Mel 🙂 I make hot dog mummies every year too, but I love your mummy cookies-how adorable! They remind me of another idea I saw in a magazine this month of mummy pizzas….Use english muffins, pizza/spaghetti sauce and then slices of mozzarella or to get perfect “wraps” you can use cheese stick pieces pulled apart. Olives for the hidden eyes of course. Super cute. Oh My Gosh! I was just looking for some fun things to make for my grandkids and you have so many. Love your site Mel and I’m so happy I found you. 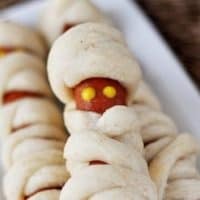 My 3 year old son looked over my shoulder this morning as I checked your blog and immediately wanted to make these mummy dogs. I was planning on making your pulled pork sandwiches, so I reserved some of the bun dough to wrap around a few dogs. He was so excited to eat it, I didn’t even get mustard eyes on until after it was almost half-way gone! i’m loving your halloween ideas this week! the monster pudding cups from yesterday were so adorable too! More recipes that are too dang too! PS Hebrew National Hot Dogs are the only brand hot dogs allowed in my house too! Oh the cookies! Can’t wait to make. Thank you for such a simple and adorable idea. I promised my son cookies today. . . this is perfect. What a fun and cute idea for Halloween treats! You are so creative, Mel. Thanks for sharing and inspiring me for the upcoming holiday! Love the hot dogs. I tried that once, but yours look much nicer! So cute!! I’ve been eyeing those bug designs in Hello Cupcake – I love that you did them on cookies!! This is all very cool. You’ve awakened a craving for hotdogs in me. Yet another “how cute are they?” moment! You are so creative, Mel! We don’t eat hot dogs very often, but when we do Hebrew National is our favorite brand, too. I really like the low-fat ones! But seriously- what’s up with only 7 hot dogs in their package? Don’t they know that there are 8 hot dog buns in a package? What do they want us to do with the extra bun? 🙂 Ok…I’m done ranting on like Steve Banks in Father Of The Bride (one of my all-time favorite movies, by the way)! Thanks for sharing these adorable Halloween treats, Melanie! i think the whole 7-dogs thing is silly too, but I believe it is a nod to Judaeism’s belief that 7 is a perfect or holy number.